My name is Hannah Moore. For those who don't know, I am wheelchair bound, and always have been. Living in a small town (Autumn Vale, NY) there weren't many resources available to a kid in a wheelchair. I did attend school some of my youth, but I was homeschooled mostly. I had a few friends, and my Mom made sure they visited often, and we did crafts and other fun stuff together. But still... did I envy the other kids, who could run and play and most of all, go to school together? Sure I did. My parents have always done the best they could, but they couldn't give me legs that worked. However, they could - and did - give me books. There was no library in Autumn Vale back then, but my Mom and Dad took me to book fairs, second hand book stores, garage sales, and church sales... the ones that were wheelchair accessible, anyway. I had a vast collection by the time I was ten or twelve. My Dad always had time to build me more bookcases. Then one day I thought, why can't Autumn Vale have a library? I did research, I applied for grants, I hit up local businesses for donations, I asked a local property owner to donate space, and... I've done it! From being a shy booknerd afraid to talk to anyone, building a library has transformed me into someone who can speak to anyone about anything. I have my degree, I'm working on an advanced degree and... 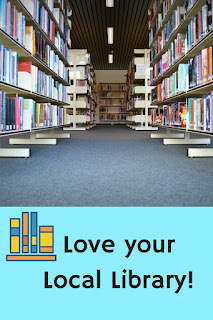 I'm doing it all for the love of libraries! Some may think the Autumn Vale Community Library is dingy; it's tucked away in a place on a sidestreet and the windows are high up. But... my personal philosophy is that a library should never be too grand, or too bright, or too modern. It should be a little shabby and have some dark corners. It should welcome all who feel that there is no place for them. (Like our local eccentric, my friend Isadore) There is a place for everybody in our library. And that leads me to say... there are many kinds of libraries, in hospitals and senior centers, nursing homes and coffee shops. There are little libraries on folks' front lawns. There are libraries all around us. People love them so much last week was National Library Week!! So... what libraries do YOU use? Or... tell me your library memories! The Merry Muffin Mysteries WILL be back in 2019! I have just signed to write three more, starting with Muffin But Trouble in 2019. More news to come! 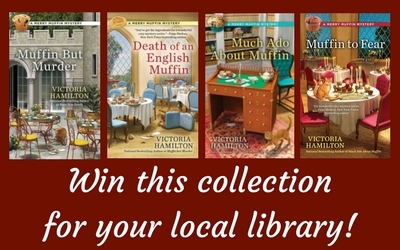 Sign up for my newsletter at VictoriaHamiltonMysteries dot com! And now... a Library Giveaway!! Good day, all! I will be giving, to the library of your choice - and that can be a nursing home library, senior center library or any small town or city library - an assortment of a few of my Merry Muffin Mystery books. Please, in the comments, tell me what library you'd like the books for, and why they could use them. Leave me your name and an email where I can reach you (yourname at yourserver dot com) and enter by Midnight, April 23rd!! Canada and the US only, please! Newfane Local Library is a small community library. The newest project is local author day- they hold events where authors can meet the public, sell their books. In return, they ask for the donation of a book. That way, they can expand the offerings and help people expand their horizons. Would love to add this to the collection. Cheers (at) Marjimmanor 9dot) com. Love for my local library to be able to carry these books. Laramie County Library Systrms of Cheyenne, Wy. Seems that cozies are high demand but selection is limited. I would like the Charlotte County Library System in Port Charlotte, FL to have these wonderful books as they do not carry very many cozy mysteries. If there is a book that I want to read they never have it and I have to submit a request for them to buy it. They will only do that for recent books though. Thank you for this very generous offer to help libraries. Hickory Public Library in Hickory, North Carolina. Their cozy mystery selection is really small so I would love for them to be able to offer a few more. Fairborn Branch of the Greene County Public Library, Fairborn, Ohio. They don't have any of your books at this point. Thanks for the chance! eeyoregirl2009 (at) aol (dot) com. The Eckhart Public Library in Auburn, Indiana is my choice. It had a horrific fire last July. It was a historic building with a new addition. All the books and everything was ruined by the soot. Anyway, the library has gone on without the building, thanks to being able to get books from other libraries in part. It was projected to be restored by October, but now, it looks like sometime in 2019. I grew up with this library. It was a cozy, safe place. They could sure use books now. I have loved libraries since I was a child. Now I rely on library-by-mail in Glen Burnie MD. Such nice librarians for whom it is never too much trouble to try to find a book I want. Thank you for your generous gift to some lucky library. My library is the Horsham Township Public Library in Horsham PA. While it has a nice selection, it could use more cozies. It is part of a selection of libraries that combine their catalogs with others to get you most anything. They have a van that travels between libraries picking up and delivering requested books. My local library was so well used that they decided to build another branch nearby. I believe both branches are quite actively used. I have been using the Chicopee library since I was around 7 and now I am 70! I love that our libraries in Western Massachusetts share so that if my library does not ha e a book I can put on hold from another one and they deliver it to my library. Thank you for this chance to get some books for my library. My library is the Howard Beach branch of the Queens County Libraries in Queens NY. I donate almost 100 books a year to them. I bring them unread books that don't interest me and once read books whose authors I don't collect. All of them are placed into circulation and helps stretch out their yearly budget. I love my local public library - Wolcott Public Library, In times of budget cuts, they can use the help. Thank you everyone for entering! The winner is the Gladbrook Public Library of Gladbrook, Iowa! And thank you all for supporting your local library.